In a barter system, people exchange goods and services without using a monetary medium of exchange, such as cash. Despite the system being used in a limited capacity these days, it is still subject to tax according to the Internal Revenue Service. The amount will be calculated on a fair market value where individuals are required to inform about the income or capital gains they secured in exchange of a particular service. In order to account for bartering income, there must be a mutual understanding between both parties. For instance, if a doctor helps a patient (plumber), but instead of charging a fee gets help in the form of repairs, then according to the IRS regulation, both must pay taxes according to the fair market value of the corresponding services. Even though no cash transaction has been recorded, the exchange must be treated as a sale. The above trade is an informal bartering swap between two entities. Recording these transactions may be difficult for various reasons as individuals require comparable values to verify the sale. Moreover, it is based on mutual trust as no membership fee is charged. Tracing such barter movements can be difficult given that it will usually be based upon mutual understanding. 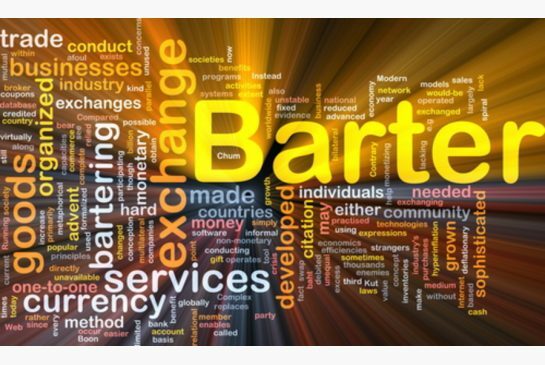 However, with rapid globalization, barter has become a global form of trade where organizations are able to connect with other businesses on a global scale. This has paved way for a more formal barter exchange, where individuals will need to report the transaction, both online and in person, through the IRS Form 1099-B, referred to as “ Proceeds from Broker and Barter Exchange Transactions”. There are certain exemptions that can be exercised by foreign persons as mentioned by the IRS, and on those transactions which are less than $1.00. The tax payable will differ according to the goods and services exchanged. For instance, any revenue generated through common trading will reflect the fair market value and be reported as taxable income. However, if any item appreciates in value, such as jewellery, then revenue will be subject to tax in the form of capital gains.